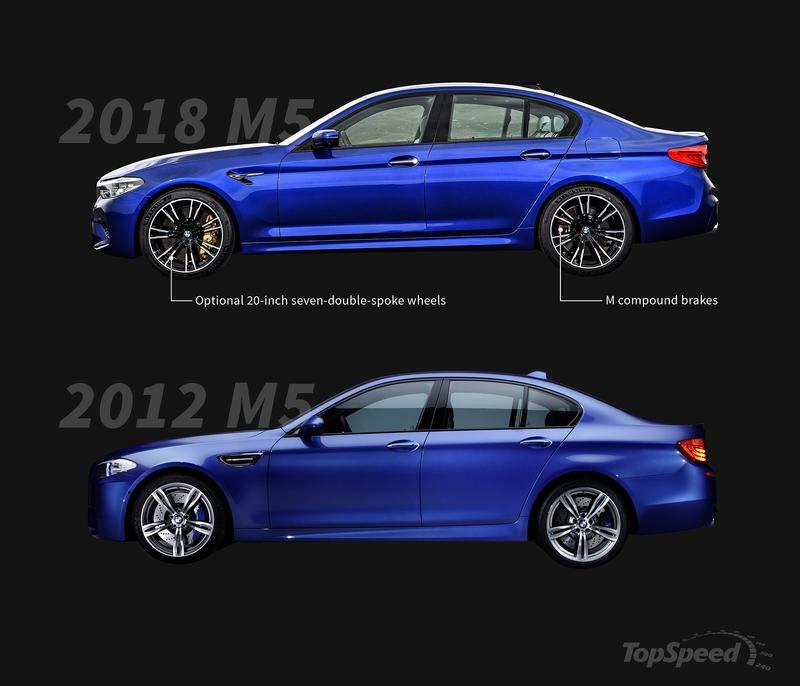 BMW M5: Old vs New The seventh-gen BMW M5 debuted for the 2018 model year with fresh exterior looks, an updated interior, competitive technology, more power, and a serious driveline update! Exterior - Front End Up front, the M5 sees a more aggressive bumper, angular headlight LEDs, thicker grille surrounds, dual grille louvers, a CFRP roof, and an aluminum hood for less weight. Exterior - Side View The side profile sees stronger body lines, thinner mirrors, revised M-specific wheels, and revised M-specific wheels. 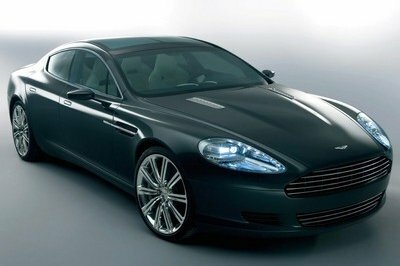 20-inch double-spoke wheels are optional. Exterior - Rear End Around back, the new M5 gets sleeker taillights with rounded corners, a revised fascia with more commanding overhangs above the exhaust, and a revised rear diffuser with four fins. Dimensions As far as dimensions go, the new M5 has grown by 2.16-inches in length, 0.86-inches in height, and 0.47-inches in width. Interior - Front The interior has been heavily revised with a new M-style instrument cluster, 10.25-inch floating infotainment screen, revised center stack, redesigned gear shifter w/ rocker switch, and a revised steering wheel with thinner spokes and a smaller central hub. 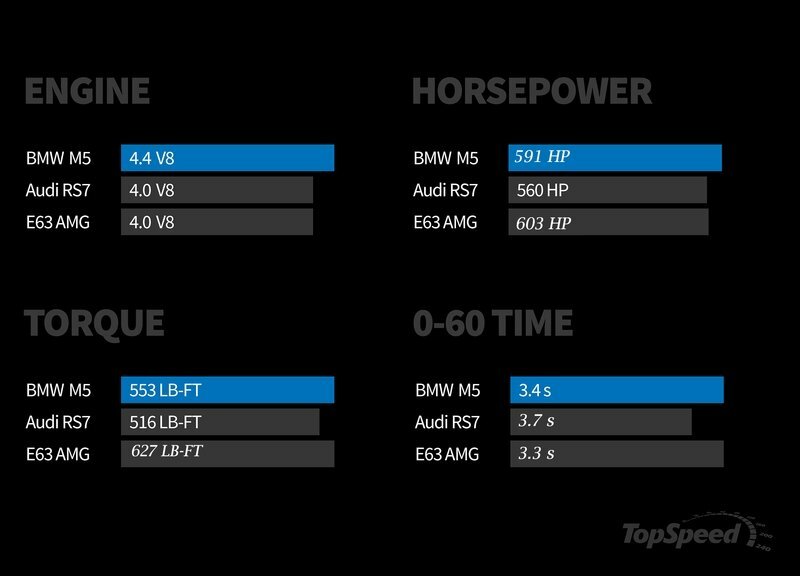 Drivetrain vs Competition The M5 gets a revised 4.4-liter V-8 that’s good for 591 ponies and 552 lb-ft, 38 horses and 51 lb-ft more than the outgoing model. More importantly, the M5 now gets AWD, a first for this nameplate. What changes do you spot? 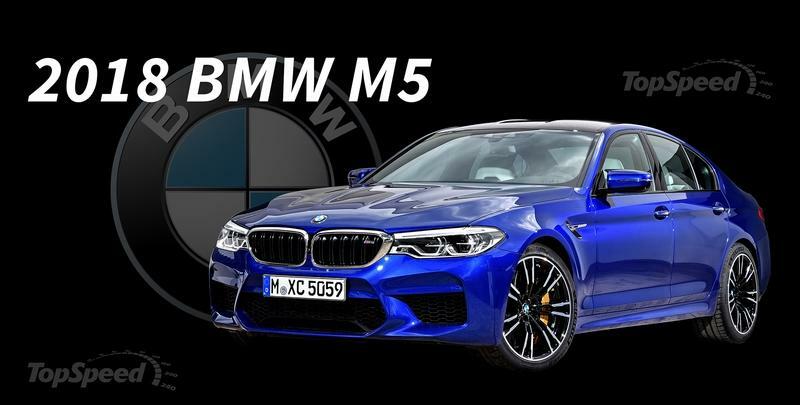 2017 brought us the new BMW 5 Series, so it’s only fitting that 2018 brings us a new M5. We must have been good this year because Santa came early, and with him, he brought a whole slew of updates that include an updated V-8, loads of new technology, BMW’s xDrive AWD system as standard (optional outside the U.S.,) a lighter chassis, and better performance. Talk about some good news, right? Truth be told, the M5 dropped as much as 127 pounds, has more aggressive styling, an updated interior with the latest infotainment system, and an extra 38 ponies and 51 pound-feet over the outgoing model – that brings total output figures up to 591 horsepower and 553 pound-feet of torque. 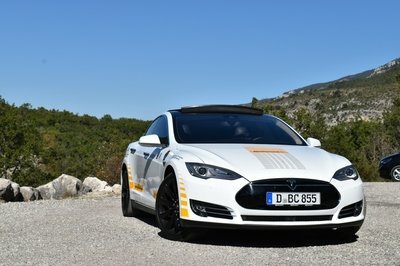 It can now hit 62 mph in as little as 3.4 seconds and 124 mph in just 11.1 seconds. Of course, top speed is still pinned at 155 mph, unless you get the M Driver’s package, which increases the top speed to 189 mph. 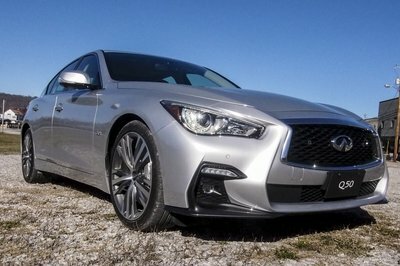 Now, it’s set to take on other established beasts in the market that include the Mercedes-AMG E63, the Audi RS7, and the Cadillac CTS-V – I know, it’s not German, but this thing is seriously a beast, so don’t get caught slipping because it will eat you alive. 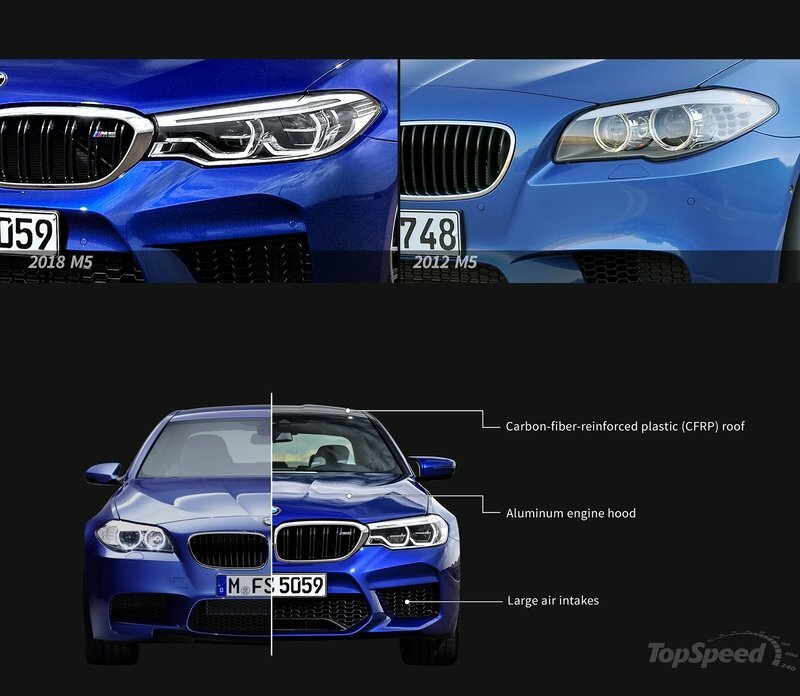 With all this in mind, we decided to throw together a little infographic for the M5 to help bring its best features and qualities to the forefront. Check it all out in our visual comparison below. 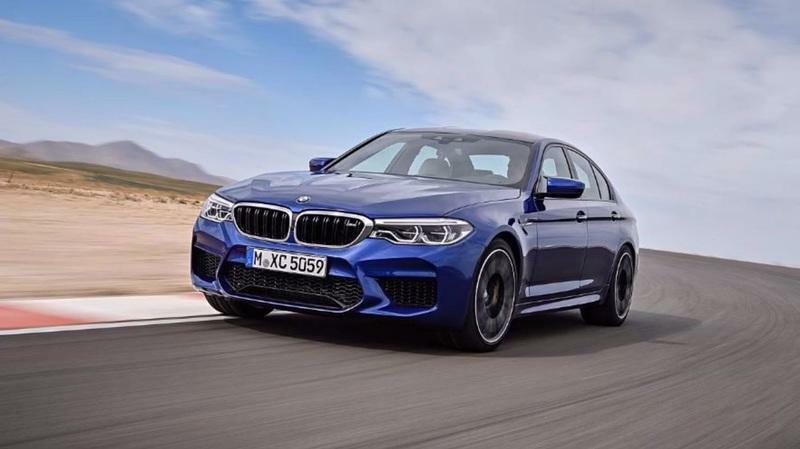 The seventh-gen BMW M5 debuted for the 2018 model year with fresh exterior looks, an updated interior, competitive technology, more power, and a serious driveline update! Up front, the M5 sees a more aggressive bumper, angular headlight LEDs, thicker grille surrounds, dual grille louvers, a CFRP roof, and an aluminum hood for less weight. 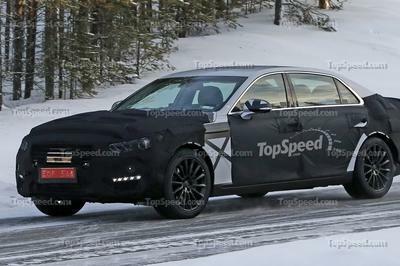 The side profile sees stronger body lines, thinner mirrors, revised M-specific wheels, and revised M-specific wheels. 20-inch double-spoke wheels are optional. 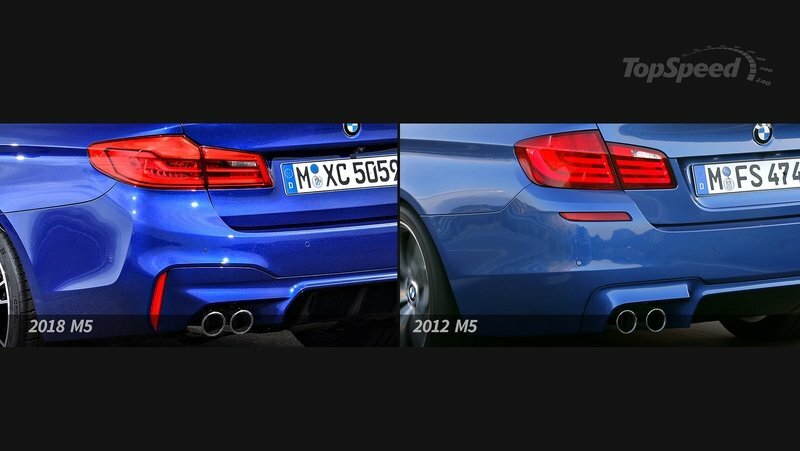 Around back, the new M5 gets sleeker taillights with rounded corners, a revised fascia with more commanding overhangs above the exhaust, and a revised rear diffuser with four fins. 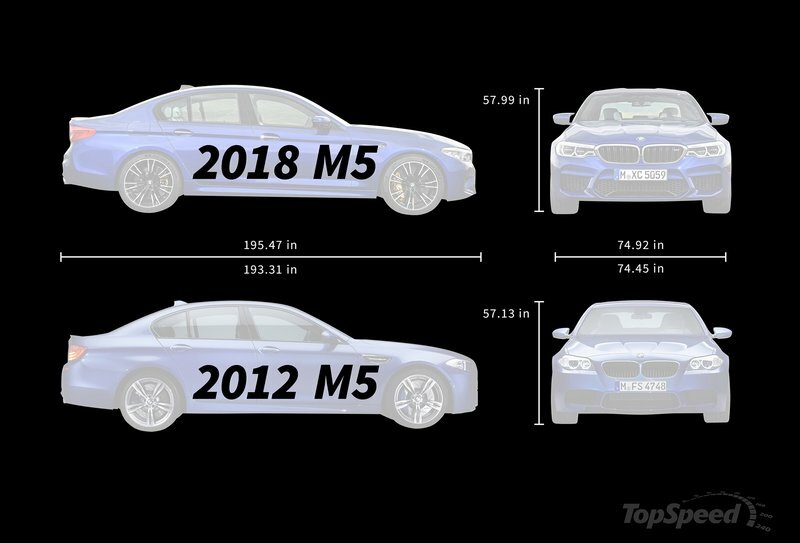 As far as dimensions go, the new M5 has grown by 2.16-inches in length, 0.86-inches in height, and 0.47-inches in width. 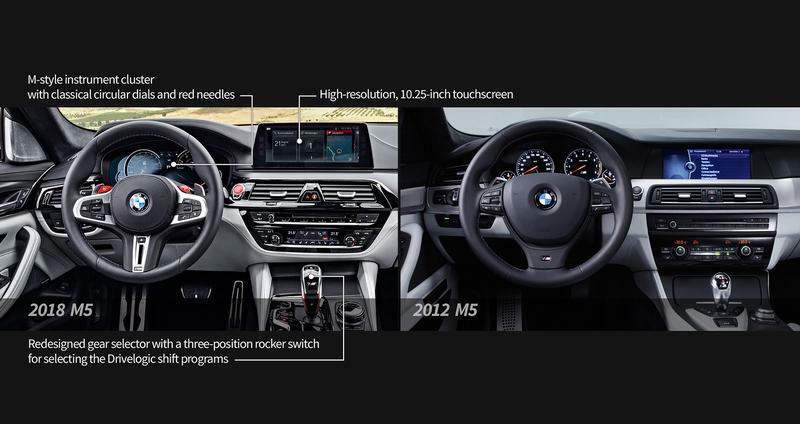 The interior has been heavily revised with a new M-style instrument cluster, 10.25-inch floating infotainment screen, revised center stack, redesigned gear shifter w/ rocker switch, and a revised steering wheel with thinner spokes and a smaller central hub. 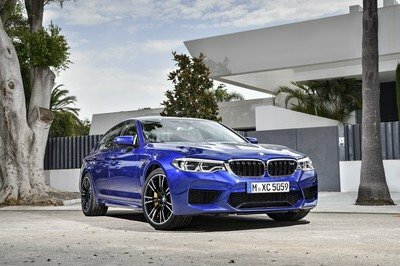 The M5 gets a revised 4.4-liter V-8 that’s good for 591 ponies and 552 lb-ft, 38 horses and 51 lb-ft more than the outgoing model. More importantly, the M5 now gets AWD, a first for this nameplate. Read our full review on the 2018 BMW M5.